* This review was originally published in Gramarye: The Journal of the Sussex Centre for Folklore, Fairy Tales and Fantasy, Winter 2014, Issue 6, pp. 80-2. For my research on Tolkien’s The Fall of Arthur before the poem’s publication (when only a fragment was available) see my 2007 article “Tolkien’s “‘Celtic’ type of legends”: Merging Traditions“. For my views since the publication of The Fall of Arthur, including how this work interacts with Tolkien’s translation of Beowulf, see my Oxonmoot talk: “Sailing to the West: the Fall of Arthur, Beowulf and Tol Eressëa“. Tolkien, J.R.R. 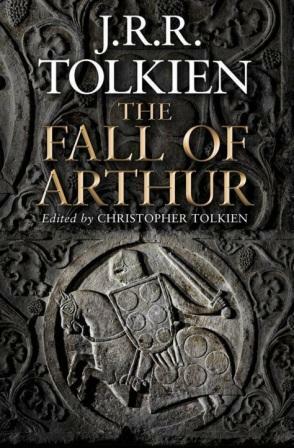 The Fall of Arthur, edited by Christopher Tolkien. London: HarperCollins, 2013. 233 pp. £14.99 (hbk). ISBN 978-0007489947. The existence of Tolkien’s alliterative poem The Fall of Arthur has been known since the publication of Tolkien’s official biography by H. Carpenter in 1977. Carpenter gave a few lines of the poem which remained the only tantalising glimpses of this work, until Christopher Tolkien edited and presented to the world the entire text last year (May 2013). As many of Tolkien’s literary endeavours, this poem was never finished, but Christopher Tolkien’s edition gives all existing 954 lines, together with drafts and notes for the projected continuation and ending of the poem, and a number of supplementary essay-length commentaries. The volume begins with a brief Preface, in which Christopher Tolkien attempts a dating of the poem, emphasises the importance of its alliterative metre and outlines the commentary texts that follow it. The poem itself follows, divided into four cantos. Canto I begins with Arthur’s campaign in the East, where news reaches him of Mordred’s betrayal. In Canto II, Mordred hears that Arthur is heading back to Britain, but the main focus of the Canto is Mordred’s lust for Guinevere, and her escape to Wales. Canto III takes us to Benwick and the brooding Lancelot, now banished from Arthur’s side due to his previous affair with Guinevere. Canto IV sees Arthur and Gawain approaching Britain, where a sea battle ensues between their fleet and Mordred’s forces. And that’s where the poem, sadly, breaks off. Continuation plans include the death of Gawain soon after, and Arthur’s lament. This volume is one of a great number of his father’s unpublished works that Christopher Tolkien has edited and his preface demonstrates the voice of an experienced editor who has a firm understanding of the variant audiences this book will appeal to. It is probably for this reason why this book follows a very straightforward structure: the text of his father’s poem first , followed by commentaries “of a decidedly optional nature” (p. 13). The commentaries focus on the poem’s sources, its links to Tolkien’s extended mythology, and its evolution through various drafts. The first essay-length commentary situates the poem within the Arthurian tradition, tracing its sources in the Alliterative Morte Arthure, the Stanzaic Morte Arthur and Malory’s Le Morte Darthur. Although there is a detailed consideration of exactly which parts of these sources inspired Tolkien, and how he creatively reshaped and adapted them, this essay can be difficult to follow for readers who are not familiar with the Arthurian tradition, and especially with the texts Tolkien drew upon and their complex relationships. Christopher Tolkien expertly navigates the Galfridian Arthurian legacy and its evolution in the English “historical” or “chronicle” Arthurian tradition. The essay, therefore, is richly rewarding for the medievalist or Arthurian scholar, but the general reader may find this part somewhat overwhelming and may wish to consult works of a more introductory nature on the Arthurian legend in order to contextualize Tolkien’s poem. The second essay-commentary is perhaps the most astounding and the one of most interest to the Tolkien scholar: Christopher Tolkien offers Tolkien’s notes and drafts on the projected continuation of the poem, which reveal his plans to link Avalon, to which Arthur departs after the last battle, with Tol Eressëa of his own invented mythology. At the same time, Lancelot seems to take the place of Eärendel, a crucial character in the mythology, best known from the published Silmarillion. Christopher Tolkien presents a detailed exploration of the use of the place-name “Avallon” (sic) in Tolkien’s legendarium around the same time he was composing The Fall of Arthur, but he is at a loss to explain exactly how his father was planning to make his own invented world and the Arthurian legend “fit”. No doubt, future Tolkien scholarship will attempt to analyse this remarkable conjuncture, possibly within the on-going discussion of Tolkien’s different conceptions of a “framework” for his mythology. The last essay-commentary focuses on the evolution of the poem. Christopher Tolkien gives variant readings of parts of the poem, based on Tolkien’s drafts, and also presents a credible hypothesis of the chronological order the existing Cantos were composed. The material presented here gives an insight into Tolkien’s process of composition, and at times fleshes out characters, or gives more detailed motives for some of their actions. The poem itself deserves further discussion in this review. Tolkien is a master of the alliterative form, samples of which have been seen in print before, notably in verses associated with the Rohirrim in The Lord of the Rings, but also Tolkien’s translation of Sir Gawain and the Green Knight, and his own Homecoming of Beorhtnoth Beorhthelm’s Son. But what stays with the reader is the use of natural imagery and “pathetic fallacy”, such as the storm in Canto III, which seems to reflect Lancelot and his brooding thoughts. Readers who pick up this book because of their love of Tolkien’s work, will recognise glimpses of The Hobbit and The Lord of the Rings in Canto I: the location where Arthur is preparing for battle is a “veiled forest” called “Mirkwood”, populated by ravens, eagles and wolves (lines 68, 71, 76-8). We also hear of anthropomorphised “trees looming forth with twisted arms” (line 128). Readers familiar with the Arthurian legend will find Tolkien’s portrayal of Mordred and Guinevere interesting and distinctive. Mordred is predictably dark and treacherous, but his lust for Guinevere, quite graphically described in Canto II, is perhaps the most memorable aspect of his character. Guinevere herself is introduced through a sensual description, while lying asleep, but in the poem she is a “femme fatale”, clearly blamed for her affair with Lancelot and the breaking of the fellowship of the Round Table. The lines: “as fair and fell as fay woman/ in the world walking for the woe of men” (Canto II, lines 28-9) are repeated, with slight variations, in Canto III (lines 55-6). The poem, like one of its source-texts, the Alliterative Morte Arthure, foregrounds much more the importance of male homosocial bonds, rather than “courtly love”. This fits with the English “chronicle” Arthurian tradition, but also with Tolkien’s academic and social life, as described in his official biography. Indeed, the close relationship between Arthur and Gawain as comrades in battle is a significant one in the poem, while Lancelot’s sorrow in the loss of a similar relationship with Arthur is expressed in the beautiful lines (in which Tolkien brilliantly combines alliteration with chiasmus): “He his lord betrayed to love yielding,/ and love forsaking lord regained not;” (Canto III, lines 15-6, repeated in lines 140-1; the drafts of the poem presented in the third commentary-essay actually show that Tolkien worked hard to achieve these lines). The book ends with some “bonus” Tolkien material: an expanded version of a lecture on ‘Anglo-Saxon Verse’ that Tolkien originally developed for a 1938 BBC radio broadcast, in which he explains how the Old English alliterative metre works, with specific examples. This section of the book serves as a succinct, yet lucid introduction to the poem’s metre to readers that are unfamiliar with it, and is evidence of Tolkien’s lecturing charisma. This fascinating volume presents an eclectic mix of elements that appeal to the general and specialist reader alike: Tolkien’s powerful attempt to retell one of the most popular stories of Western culture in an unusual (for modern sensibilities) verse form; complex scholarly notes, alongside Tolkien’s lucid lecturing style; and an intriguing glimpse into potential links between the Arthurian legend and Tolkien’s own invented mythology. For what more can one ask?